In high-pressure situations, there is no such thing as too much extra ammunition. The rugged and convenient 875 Judge/Governor cartridge holder from Gould & Goodrich holds six .410 gauge shotgun shells or .45 Long Colt rounds. The elastic cartridge loops adjust to fit chosen ammunition and hold it securely in place until needed, even through strenuous activity. Its genuine, top-grain leather material is tough enough to withstand wear from duty thanks to its thickness and reinforced stitching, resisting impact and abrasion. 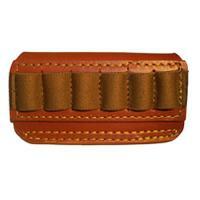 It fits securely to a belt up to 1.75 inches wide, allowing for convenient accessibility.